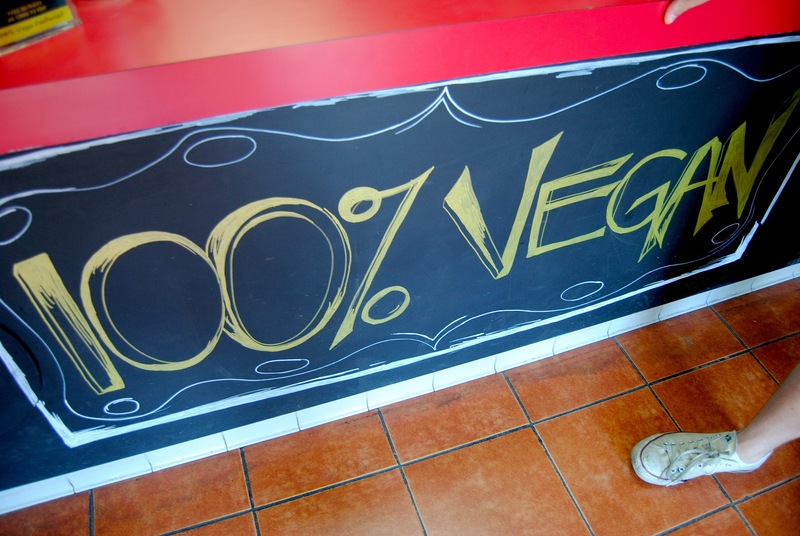 The above word represents approximately 90% of the excuses most people give me about why they could never become vegan. Thanks. Also, I guarantee that you could give up dairy. It’s really not as hard as you think. But whatever. Continue eating cheese/milk/ice cream, that’s fine. 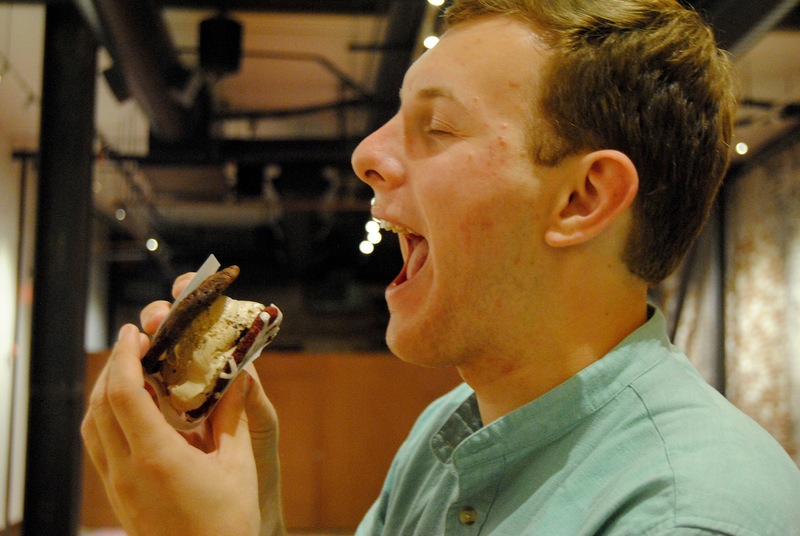 Yes, that was a slice of pizza and a slice of cheesecake and an ice cream sandwich. And yes, those were all vegan. And YES, I ATE ALL OF THEM IN ONE DAY!!!!! As A.J. and I planned our big summer road trip, I requested that one of our meals in Los Angeles would be at a vegan restaurant. 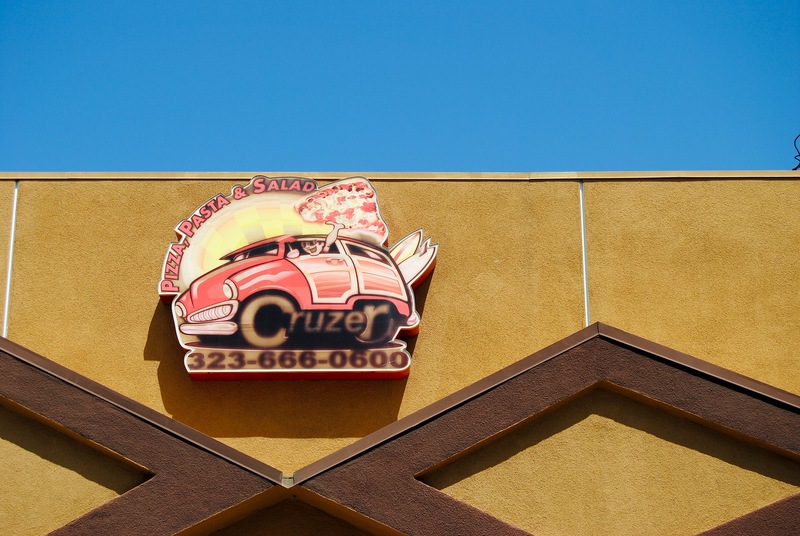 After some quick research, I found Cruzer Pizza—the only 100% vegan pizza joint in L.A.
Cruzer was tucked away on a tiny side street with maaaaybe one parking space, but that did not stop me. 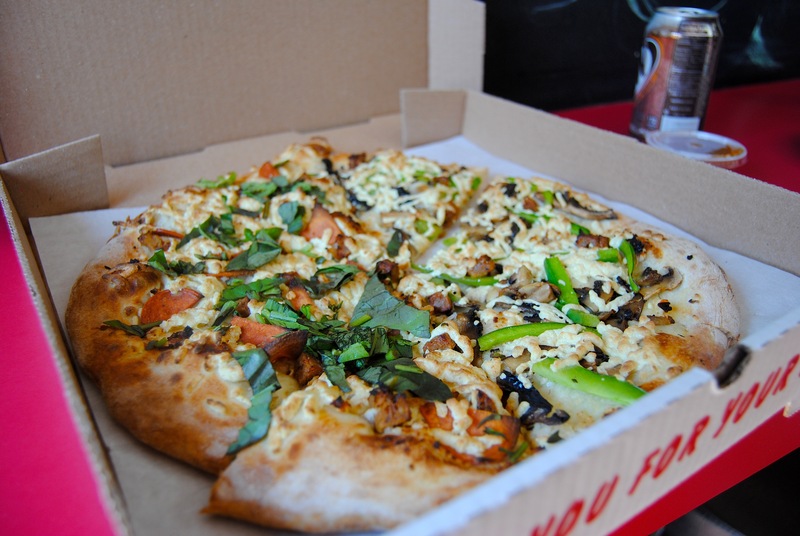 Even on the 100°F day that we were roaming around L.A., it was FRESH ‘N’ HOT VEGAN PIZZA OR DIE!!! There was just enough and not too much (just right?) “cheese” and “meat” on this pizza to make me believe it was pizza. 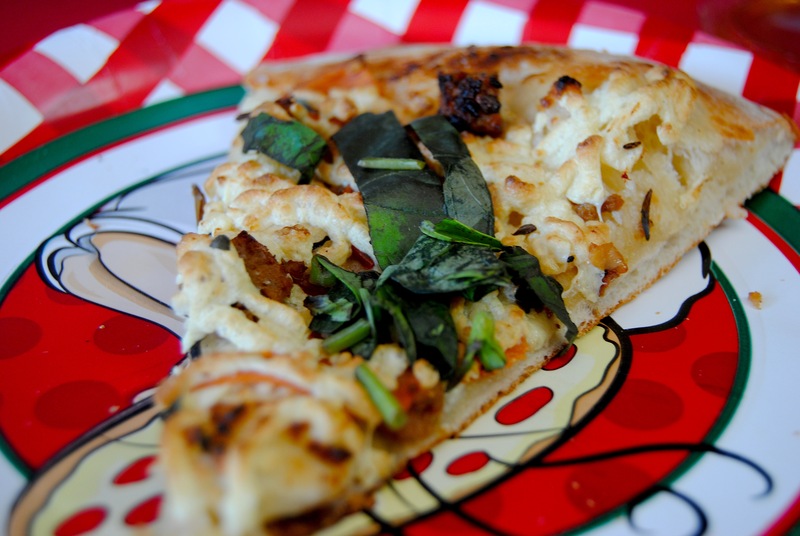 The crust was chewy and crunchy, slathered with glistening olive oil, and the vegetables were crisp and flavorful and ugggggh if I ever missed pizza since becoming vegan I certainly didn’t miss it then. I think A.J.’s verdict was somewhere along the lines of “Yeah, that was really, really good.” Mission accomplished. We were probably the only customers who visited the restaurant that day (WHICH WE SHOULDN’T HAVE BEEN BECAUSE THE FOOD WAS SO GOOD BUT WHATEVER), so naturally the owner took a liking to A.J. and me. 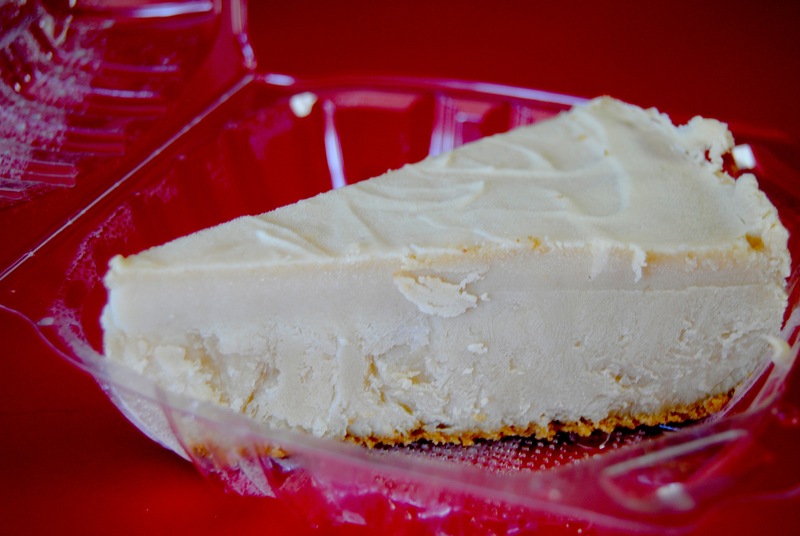 So much so that he gave us a free slice of “cheesecake” on the way out. Holla! After browsing through stores on Melrose Ave, walking through Hollywood, and driving through Beverly Hills, A.J. and I met up with his friend Colin in Pasadena for a sushi dinner. And after dinner … this happened. 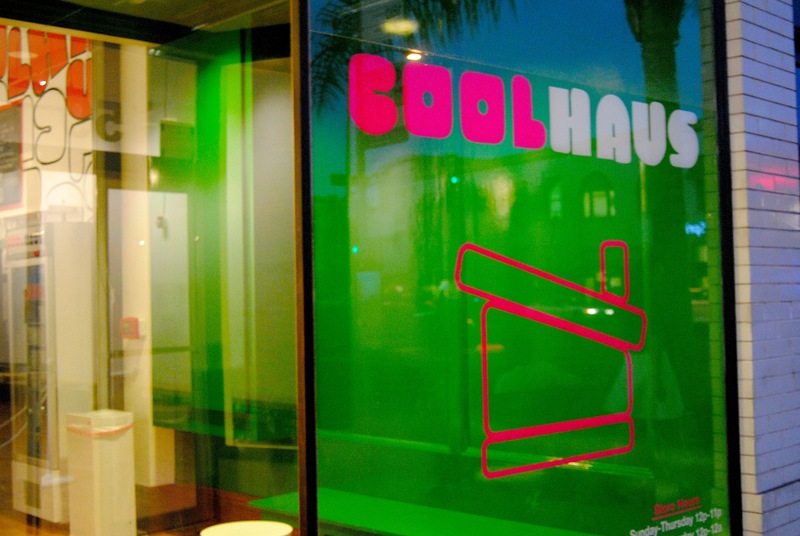 COOLHAUS used to be an ice cream sandwich food truck, but it became so popular that it started its own store. See that flavor on the right? 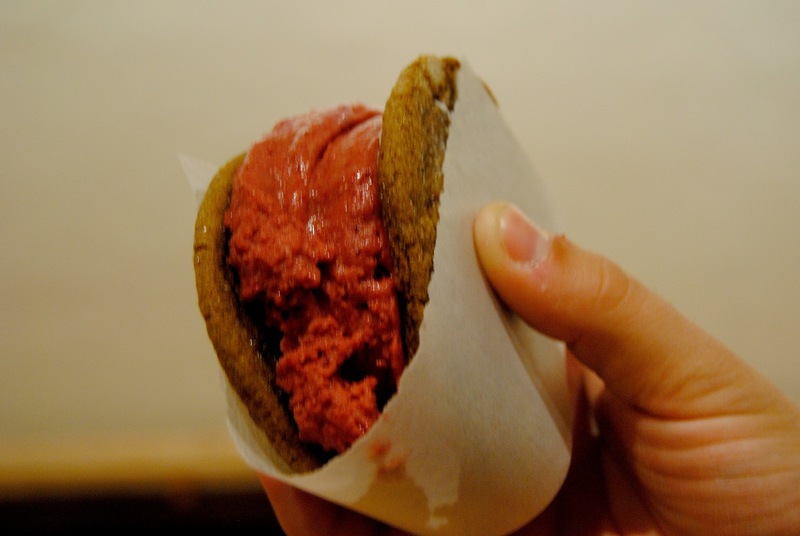 Blackberry Ginger Sorbet (V)? Whenever I see a little V … my heart stops and I become as giddy as … as Rachel Marchant in a candy store. Because that little V means VEGAN, and VEGAN means ME!!!!! COOLHAUS also had vegan cookies so WHAT’S UP I got a vegan ice cream (okay, okay! sorbet) sandwich and I DEVOURED it even as it melted all over my hands and my camera and I didn’t even care because it was so. freakin’. good. But seriously, guys. Eating vegan is not as hard as you may think. I never feel as though I’m sacrificing anything. I eat exactly how I used to eat … I just eat slightly different versions of things. 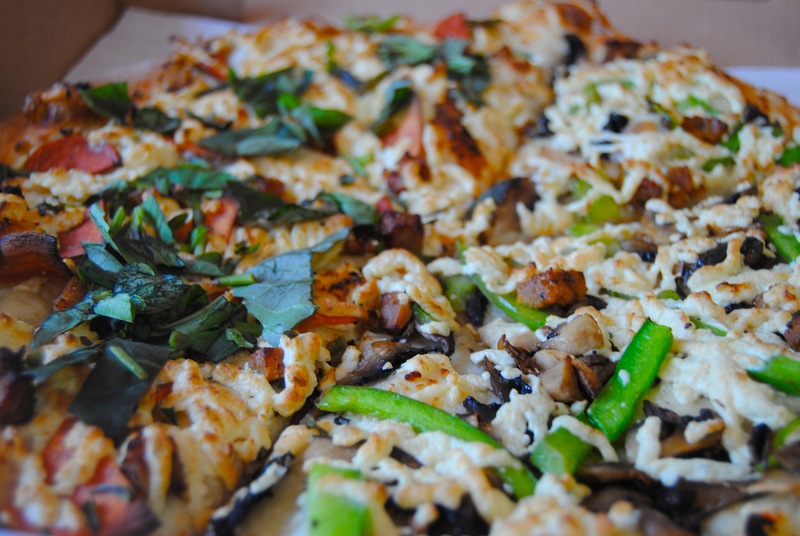 If you’re really craving pizza, Whole Foods keeps a vegan pie ready and waiting at their pizza station. If you’re out at a pizza place, grab a personal pan with no cheese—sometimes I even ask if they have soy cheese (Mellow Mushroom does!). 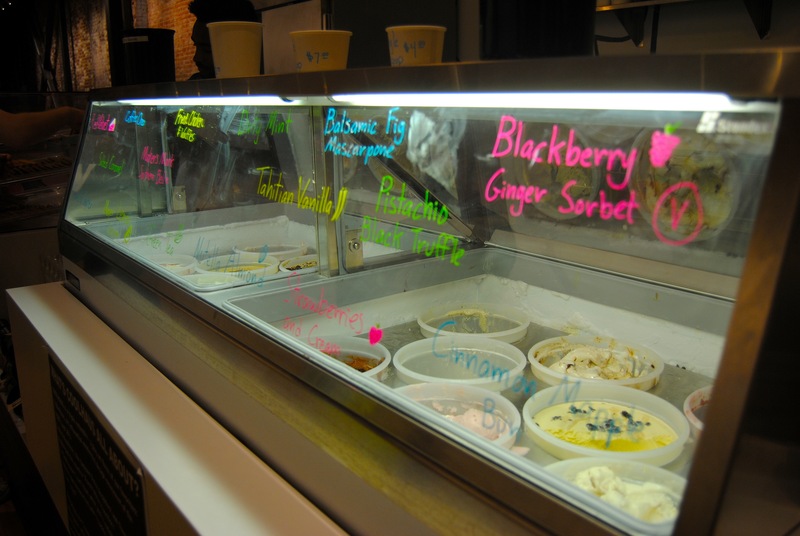 And most ice cream and fro-yo places have a non-dairy treat like sorbet. You don’t have to feel left out as a vegan. 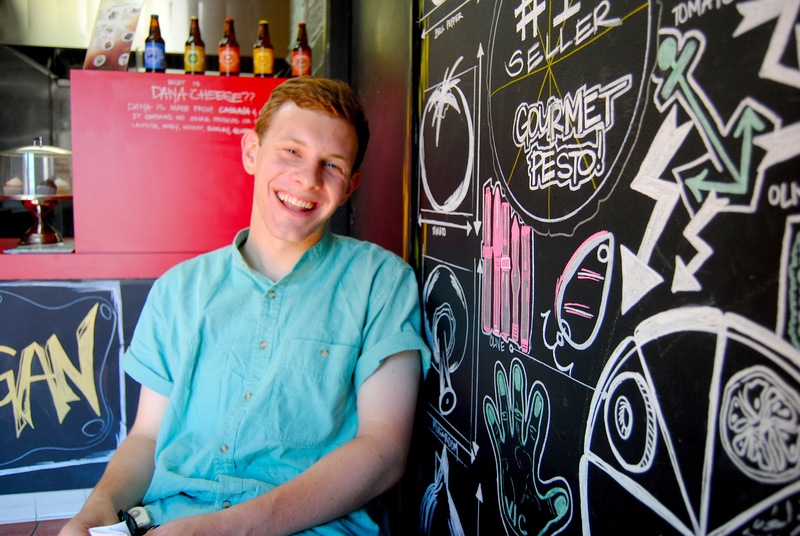 I’m happy with the food choices I have (because there are SO MANY!!!) and I’m happy with the moral choices I make—because to me, the social/ecological/ethical implications of eating vegan is more important to me than whether or not I get to eat dairy. And if you’re not convinced, just look at the pictures again. Fooled me … if it weren’t for that little V! Tags: beverly hills, california, car, cheese, cheesecake, coolhaus, cruzer, daiya, fake, heat, hollywood, hot, ice cream, la, los angeles, meat, melrose ave, milk, pasadena, pie, pizza, roadtrip, sandwich, slice, sorbet, soy, summer, vegan, vegetarian. Bookmark the permalink.